Despite an uptick in home runs last season, the major leagues are – and will always be – pitchers’ leagues. 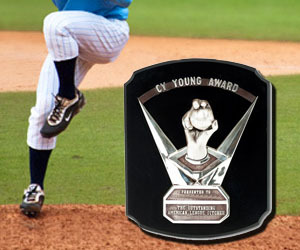 And when it comes to honoring the top arms in baseball, the Cy Young is the most sought-after individual trophy. Verlander won the American League Cy Young in 2011 while with the Detroit Tigers, also taking home AL MVP honors that same season. Now, in his second year with the World Champion Astros, Verlander is reaping the rewards of a reliable bullpen and potent lineup. The right-hander has a microscopic 1.08 ERA through 11 starts, boasting a 6-2 record in those outings. Verlander has 93 strikeouts to just 16 walks through 74 and 2/3 innings of work for Houston, with a 0.71 WHIP. He won 24 games in his 2011 campaign, which was the most from an AL Cy Young winner since Bob Welch in 1990. And while it may be a challenge to overcome that mark this summer, Verlander absolutely has the team around him to make a push for Cy Young honors. Pitchers seem to blossom under that warm Texas sun. Cole has started 2018 with a bang after coming over from the Pittsburgh Pirates in the offseason. The righty has a 5-1 record through 10 starts, with a 1.86 ERA and an American League-leading 101 strikeouts heading into the weekend. Cole has been bringing the heat for Houston, dominating batters with his fastball – namely his four-seamer. He’s leaning on his speed pitches while keeping hitters guessing with a random slider and curveball. It will be interesting to see how his arm holds up as well as his velocity, and if we see more breaking balls mixed in when the schedule hits July and August. The Yankees right-handed ace certainly has the platform to win over Cy Young voters. Severino is taking the Bronx by storm, touting a 2.35 ERA and a slim WHIP of 0.97 with 76 Ks so far in 2018. Perhaps the most impressive thing is his work away from home, with a 4-0 record and 1.67 ERA over five road starts this season. And those starts didn’t come against soft-hitting teams either. Severino has stared down big-swinging clubs like the Red Sox, Astros, and Angels. He’s received high praise from fellow ballplayers, as well as all-time greats, with legendary Dominican pitcher Pedro Martinez claiming Severino could become the best arm in baseball. These Cy Young odds don’t disagree. Sale has been dominant for so long, it’s actually strange that he’s never earned a Cy Young nod during his nine years in the show. The Red Sox ace is off to his best start since the 2014 MLB season when he won 12 games for a White Sox team that notched just 73 victories all year. Sale owns a 5-1 mark through 11 starts with a 2.17 ERA and 96 strikeouts. Sale’s lone loss came back in late April and he’s been red-hot over his last three starts entering the holiday weekend. The southpaw has nasty movement and speed on his fastballs, flirting with 100 mph each trip to the mound. Boston will likely be among the top teams in the AL standings all season, which helps sell Sale as a Cy Young contender.